Enjoy the visit to three distinct Seattle breweries in three hours on a beer and brewery tour, and get to take home a cool t-shirt and souvenir pint glass to boot. You'll be provided with safe transport along the way and the opportunity to make new, like-minded friends. Inside the breweries, you'll become acquainted with the facts and figures of what goes into a beautiful brew. Information on the history, culture and technical aspects of a good brew will be freely dispensed and of course, so will the beer! Lots of tastings are included with this tour to drink and enjoy. Learning has never been more delicious. 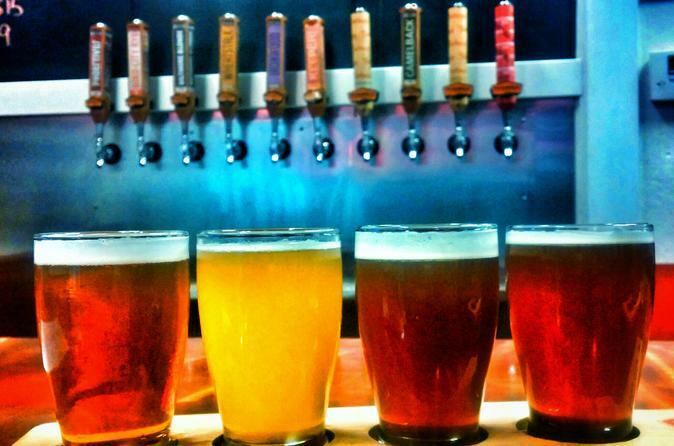 On the Brewery Tour of Seattle, you will visit 3 local breweries in about 3 hours. Start your beer drinking adventure in downtown Seattle at Seattle Beer Company where will pick you up and take you to the best breweries in Seattle. The tour guides are here to lead you down the path to great "brewvana" and explain the best of what craft brewing is all about. Once arriving at the first brewery will start sampling lots of fresh beer brewed by some of Seattle’s best brewers. While at each brewery will have plenty of time to discover what makes a brewery work, explore the brewery and of course sample great beer. After soaking up the brewery scene will visit 2 other breweries where you will enjoy more of the same brewing experience before ending the beer adventure back in downtown Seattle. Other details: Each tour can be a size of 2 to 14 guests maximum, the pickup is in Downtown Seattle in a 14 pax Ford Econoline vans and visits various parts of the city of Seattle as driving you to each brewery on the tour.